Two artists circle around the earthy and earthly. Joycean wordplay, a Johansson Projects gallery trademark no less than its odd, sod ceiling, is back after a brief vacation. 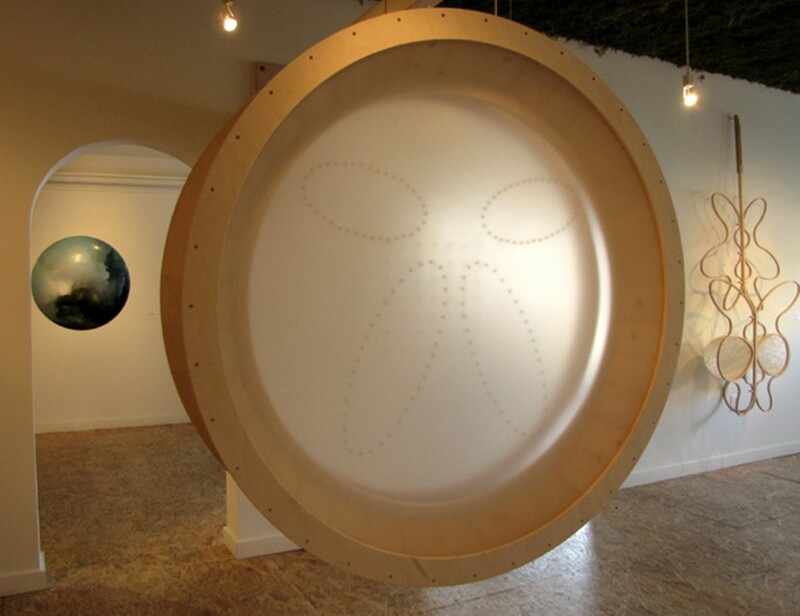 Circlesaints, featuring the work of Yvette Molina and Mike Meyers, conjoins the idea of natural cycles with that of holiness — perhaps proposing, as much contemporary art does, that we see the planet not just as raw materials awaiting capital improvement and monetization. Despite this timely message, however, the work's visual sophistication forestalls sentimental nostalgia for an imaginary Golden Age. Molina combines both abstraction and figuration in her alkyd landscape paintings on lens-like convex circular aluminum disks. Sometimes the abstract painterly element predominates, as in "Furrow," "Nimbus Catcher," "Lucern Ferre," "Choir (Earthtongues)," and the three "Wondertwin" pieces, suggesting porthole views into watery worlds, or telescopic views of gaseous or cloudy planets; and sometimes the figurative element prevails, as in the three arboreal "Throne" pieces, or the botanically inspired "Sporangia Splendor" and "Mycelium 1." This ambiguity about modes is fruitful, however, as it replicates the bifurcated way in which we see reality — binocularly and spatially coherent, with objects to eat or predators to flee, or as aesthetic spectacle, pure form and color floating across our enraptured eyeballs. "Akashic Recorders," with its radiant, supernatural burst of yellow above an evergreen skyline, is a standout. "Plants," write Molina, "have super-powers." Despite their seeming immobility, they are not passive entities but "active agents of change, relentless persistent actors in the visible and invisible forces that shape our world ... quiet bearers of our food, medicine and shelter" — with saintly forbearance for mammalian sinners.